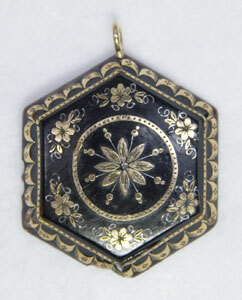 This antique Victorian hexagonal pique pendant is beautifully detailed with gold inlay. A floral design is exquisitely executed in the corners with a large flower in the center. 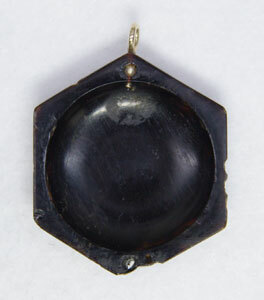 There is a slight chip on the bottom of pendant that is virtually unnoticeable when worn. Circa: 1880.